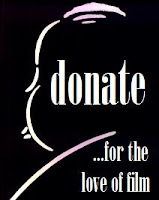 then please follow this link to make a donation to the National Film Preservation Foundation to support the effort to make the recently discovered silent film The White Shadow (1923) accessible to a wide audience via the internet. We're trying to raise $15,000 and it's going to take many generous small (and large!) donations to get there. With great appreciation for your generosity, THANK YOU! The thought of young Alfred Hitchcock as a bright and eager assistant on the set of The White Shadow (1924) reminded me of Michael Powell’s apprenticeship on Hitchcock movies like Blackmail (1929). Michael Powell eventually became a major film director himself, responsible for such classics as Black Narcissus (1947), The Red Shoes (1948), and Peeping Tom. With each of these blog entries, I’m opening with a fantasy dialogue between Hitchcock and Powell, circa 1929, as they meet at the nearest pub after a full day of shooting. 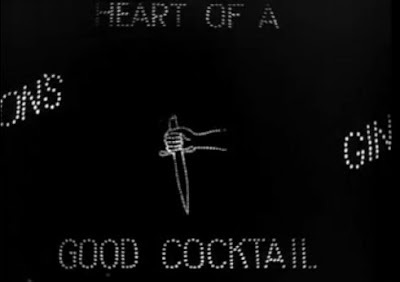 Alice's hallucination of a knife in neon from Hitchcock's Blackmail. Medium shot: Leaning against the bar, Hitchcock smiles paternally at Powell. Strangers on a Train (1951). Alice immediately following the murder in Hitchcock's Blackmail. We come to my favorite section of Blackmail. 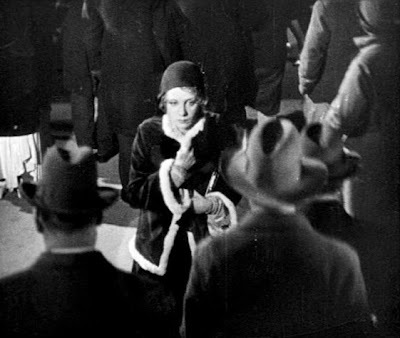 Much as I appreciate the famous “knife-knife-knife” scene and the innovative British Museum chase, my absolute favorite section is the ten-minute meditation that spans from Alice’s post-murder emergence from behind the curtain to her arrival at home the following morning. 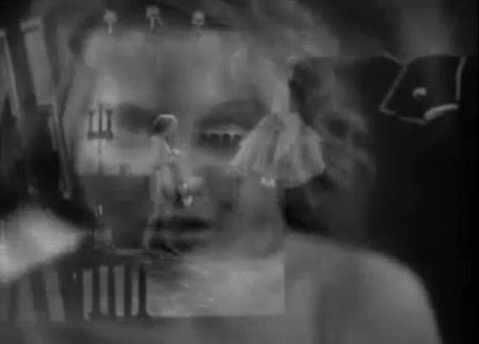 To closely examine this scene, I’m afraid I have to abandon previous efforts to link everything with Michael Powell. This isn’t the type of subject that attracted the more gregarious Powell. Much of the scene’s strength derives from the performance of Anny Ondra. Freed from the need to synchronize her speech with the off-screen dubbings of Joan Barry, Ondra shows enormous originality and compassion in her depiction of Alice’s shock, confusion, and incomprehension. And when her walk through London begins, the scene gains additional power through its use of location to comment upon our heroine’s numbed psychological state (Hitchcock meets Antonioni thirty years before l’Avventura (1960)). Alice has murdered the artist Crewe with a knife, performing the deed while hidden behind a curtain. She backs into view in a medium shot, awkwardly holding the knife and looking as puppet-like as Moira Shearer in The Tales of Hoffmann (okay, allow me the ONE Powell reference!). Appearing utterly lost, Alice loses her sense of time. Hitchcock conveys this through the use of dissolves. In typical film shorthand, a dissolve would indicate that time has elapsed, but these dissolves seem to return us to the same time and place. 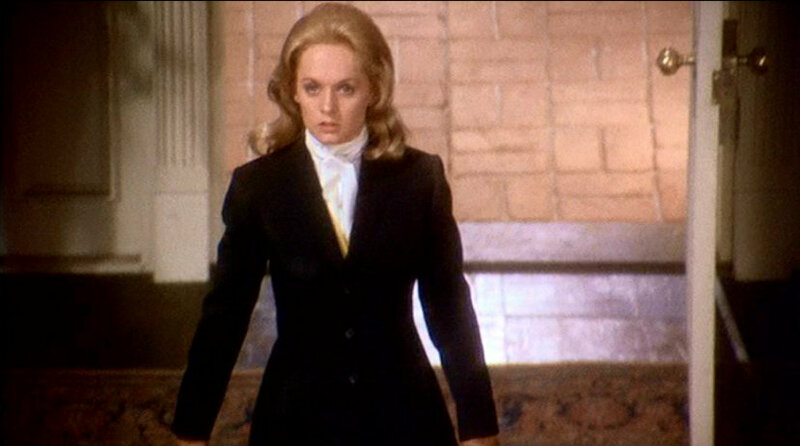 Alice walks zombie-like toward the camera and the shot dissolves to a far shot of Alice still pacing the apartment. Seconds might have elapsed or hours. We sense that Alice herself does not know how long she spends in the apartment. Alice moves directly toward the camera. The closeup dissolves to a long shot of Alice still in the apartment. Alice leaves the apartment and descends the stairs, with Hitchcock cutting to an overhead shot like he would use so effectively in later movies such as Vertigo (1958) and Psycho (1960). 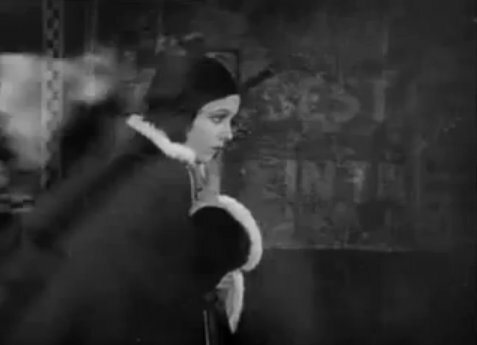 Once she is on the street, ghostly people pass by, eerily superimposed on the film to render them translucent. She is alone, apart from everyone else in the city. The world seems to cruelly comment on her plight. She passes under a marquee advertising “A New Comedy,” calling to mind the painting of the mocking jester. She sees a neon advertisement and imagines that it shows a stabbing knife. Alice and seeming ghosts of people passing her by. 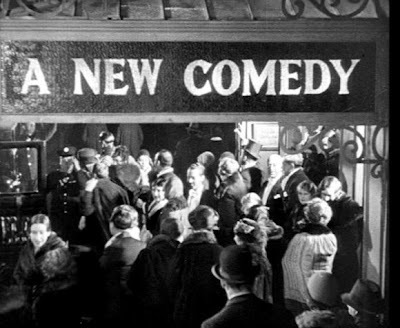 The marquee advertising "A New Comedy." Hitchcock makes use of interesting match cuts. There are two cuts from Alice seeing hands (first a policeman’s extended hand and then a sleeping beggar’s hand) to her memory of the dead man’s rigid hand. 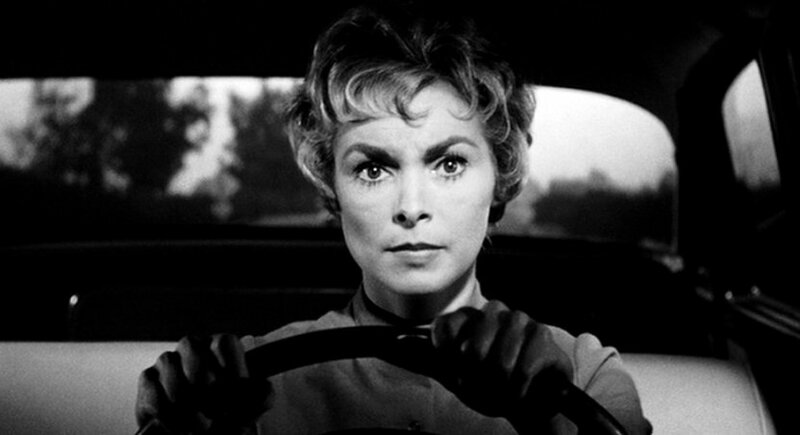 And there is an unusual aural match cut, where Hitchcock implies that Alice is about to scream only to shock cut to the landlady screaming as she finds the dead body. 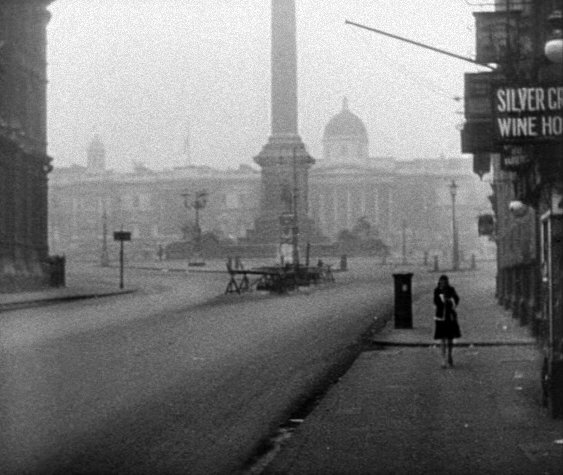 Best of all is the simple long shot of Alice still walking the deserted streets at dawn. 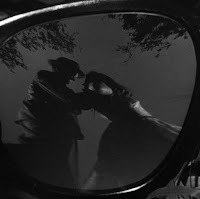 Hitchcock holds the shot for awhile, creating an effect much like that of the neo-realist cinema that emerged in Italy twenty years later (a style which Hitchcock would consciously adopt when filming The Wrong Man in 1956). Alice on the street at dawn. 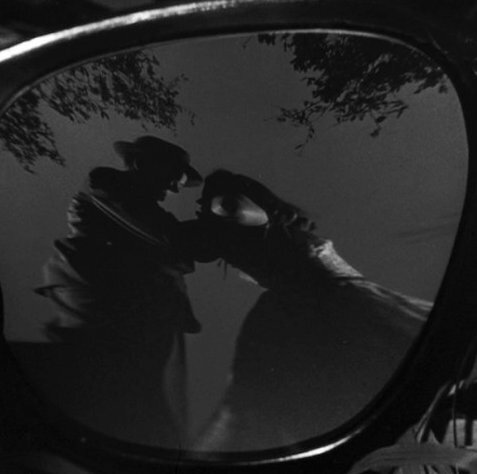 Of course, both Hitchcock and Michael Powell filmed many actors and actresses walking. But this Blackmail walk is special because of its intense evocations of stark alienation. Hitchcock had a special gift for expressing loneliness. Midway through Alice’s walk, there’s a remarkable overhead aerial shot of London. I’ve seen this described as a precursor of a similar aerial shot in The Birds (1963), but I think the point of the Blackmail shot is very different. The sad truth expressed in the shot is that the city is probably full of Alices wandering in an existential haze, each feeling utterly alone. In later movies, Hitchcock would create similar strong scenes of guilt-scarred women feeling trapped and alone. 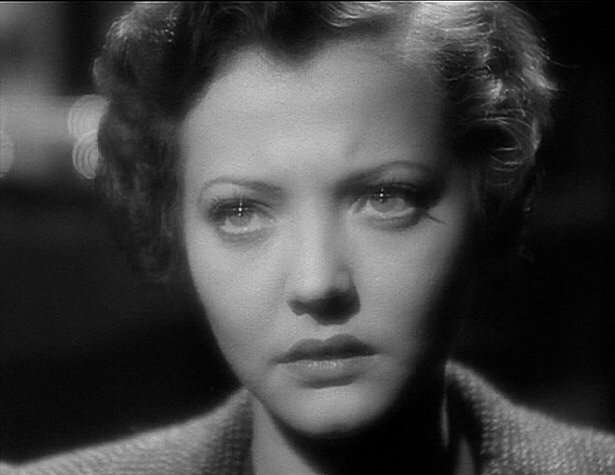 There’s Sylvia Sidney realizing the truth about her married life in Sabotage (1936), Janet Leigh driving aimlessly after she steals the money in Psycho, and Tippi Hedren’s reaction to the maiming of the horse in Marnie (1964). In each of these scenes, the bottom has dropped out of the heroine’s world. And the performances in these scenes are impeccable and heartbreaking—among the most emotionally moving in Hitchcock’s work. This isn’t the world of Michael Powell. His frequent match cuts (most notably the delightful cut from falcon to airplane in the prelude to A Canterbury Tale) expand on the experimental techniques of Blackmail but handle them in a way suitable to his own playful style. Two very different geniuses; two very different worldviews. the money in Psycho (1960), directed by Alfred Hitchcock. 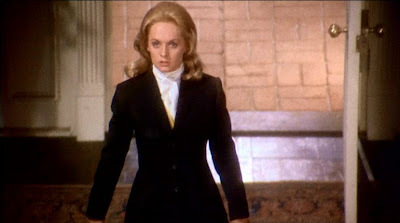 in Marnie (1964), directed by Alfred Hitchcock. A special thank you to Joe Marcincuk for tracking down and delivering a copy of A Life in Movies to me in the nick of time. The emotion of Alice's "walking scene" has a physical effect on me. I feel a chill and a knot in my stomach. I like being brought into the movie by a master storyteller.